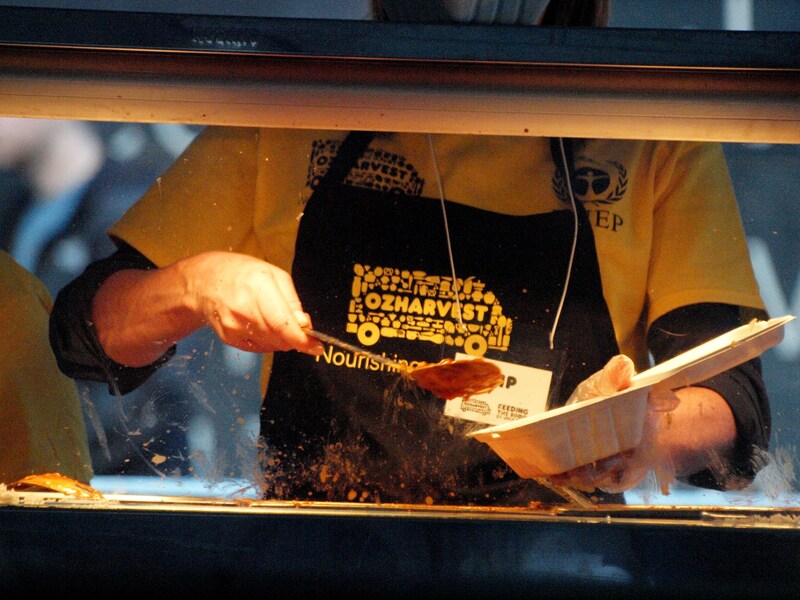 OzHarvest cooking and serving up a storm! Yesterday was a little different to most Mondays. I journeyed to the city to eat food, but it wasn’t any old lunch. It was made from rescued food that would’ve otherwise gone to waste and it was entirely free. 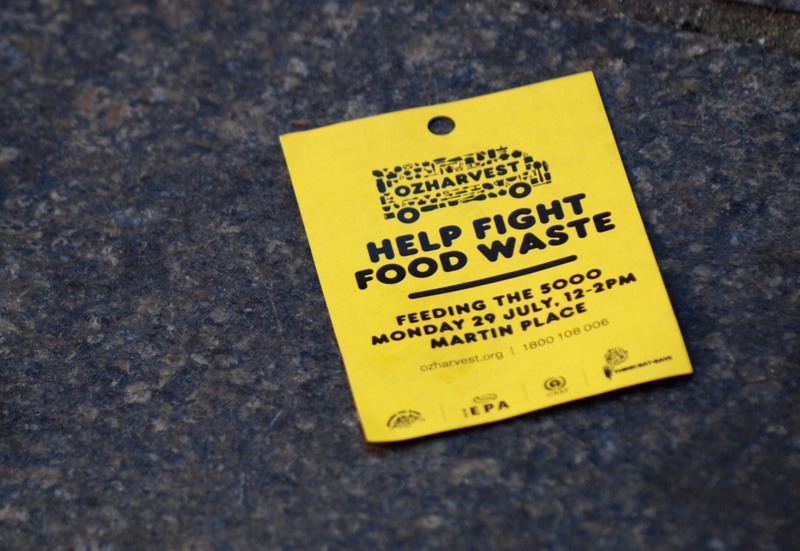 One of Australia’s leading food-rescue charities, OzHarvest (named the official Australian partner of the United Nations Environment Programme (UNEP) global campaign Think. Eat. Save. 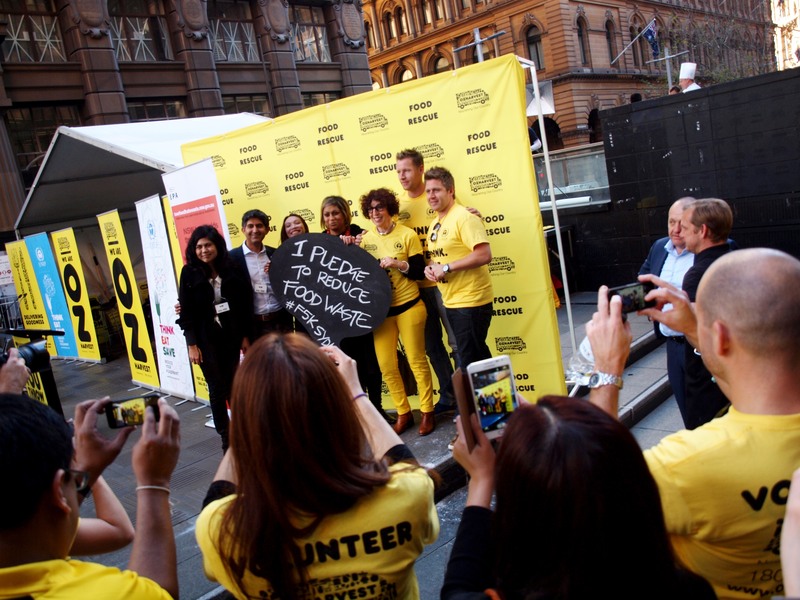 ), hosted Feeding the 5000 in Sydney’s Martin Place to highlight how simple it can be to reduce food waste* and to show ways that governments, businesses and individuals can help. I didn’t have to wait long before I got my beautiful vegie curry with onion relish, rice, natural yoghurt, and a chapati wrap. For dessert (after waiting in the biggest line there – I gotta give it to the OzHarvest volunteers), I drooled over my apple crumble with cream, it was amazing! 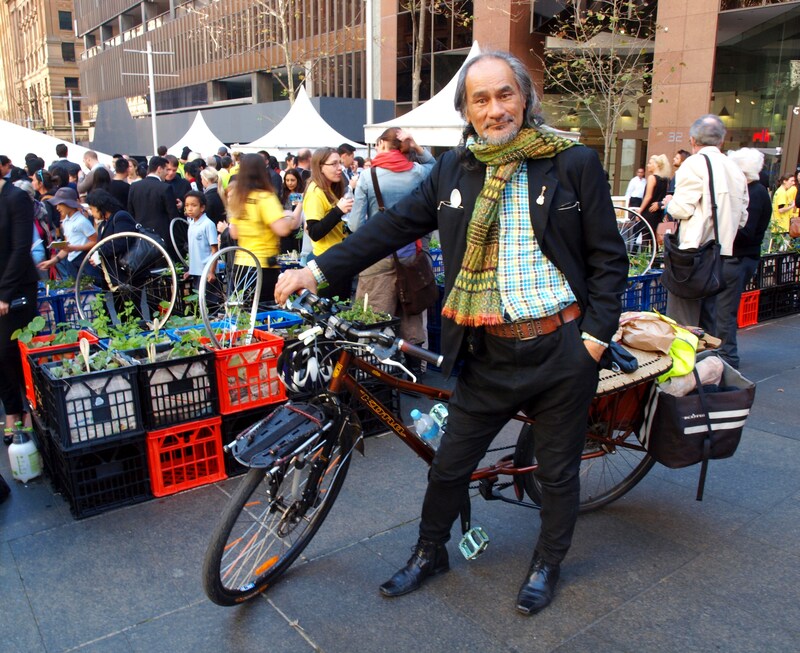 With a pop-up milk crate garden run by kids, a panel with founding director Ronnie Kahn talking food waste and changing consumers’ perspectives, and companies like The Urban Beehive and Closed Loop Recycling to show us how it’s done – looking after the planet better, that is – it was a delicious day. But I’ll let the photos do the rest of the talking. You know that wrap I was telling you about? None other than Costa Giorgiadis and Peter Overton gave it to me. Don’t you love the beard? 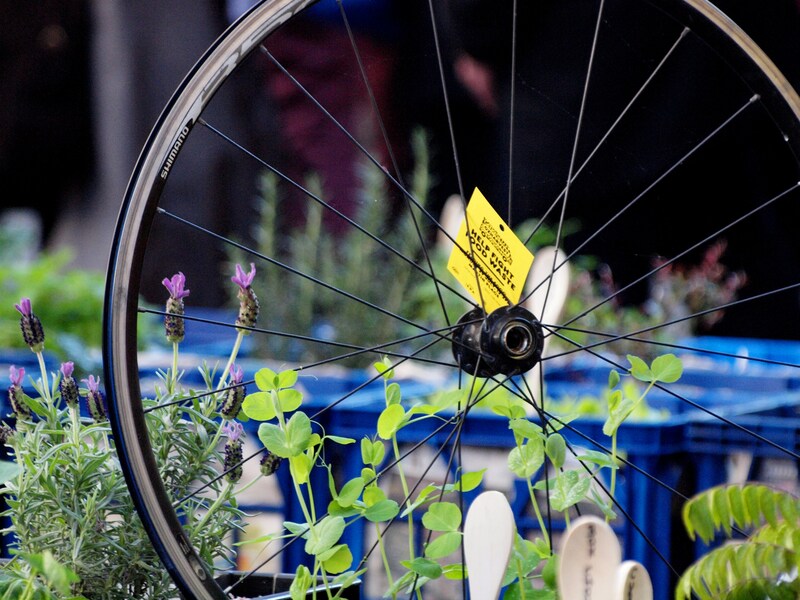 Here are some pics of the “Milk Crate Pop-Up Garden.” You wouldn’t think it could be so easy, but we had kids showing us how it’s done. The panel, with OzHarvest’s founding director, Ronni Kahn talking food waste and changing consumer perceptions. Barry from Recycables – This guy is so much FOR recycling that he’s going around the world (or traveling far and wide) on his bike to talk recycling. 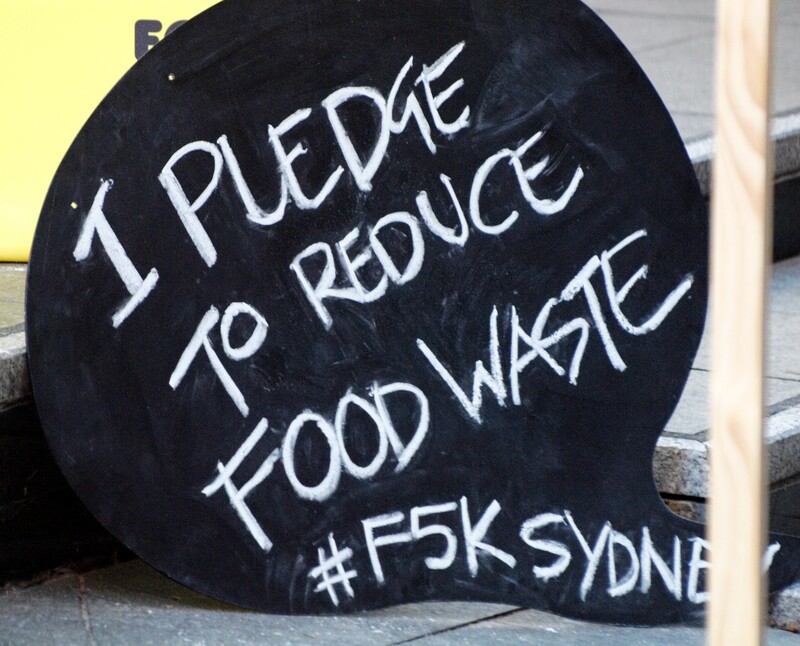 Will you pledge to reduce food waste? The end result: Feeding the 5000 was a beauty. *Did you know Australians waste about $7.8 BILLION of food every year!? That’s crazy talk! Previous postIs the silver lining within you?